Posted March 15, 2018 • filed under Experience, News. In 2010 when we began this adventure into new forms of writing, we had no real idea what we would receive as entries. A colleague of mine, Sue Luminati, was creating the first (and as it turned out, only) Poole Literary Festival. Sue pulled off a great success with some terrific print writers as the star attractions, including Michael Morpurgo and Carol Ann Duffy. Sue was interested in digital storytelling and wanted to include an event within the festival to celebrate new kinds of writing – and that’s where I came in. Having researched readers’ responses to hyper-writing – a term I’ve used for writing that utilises hyperlinks, hyperactivity, interactivity, etc – for my PhD, and having worked with young people on digital storytelling projects, I knew something about the opportunities and issues around interactive digital literature. Sue and I threw open the first New Media Writing Prize. And, wow, were we impressed with the work we saw! Screenshot from part of Underbelly, by Christine Wilks. Christine Wilks’ winning entry Underbelly still strikes me as being one of the most beautiful and immersive pieces of digital-interactive storytelling I’ve seen among all the entries for NMWP. 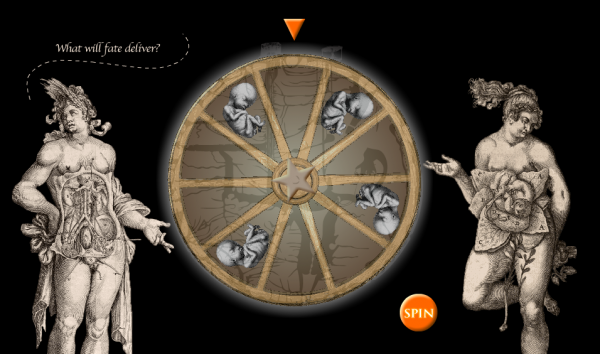 The interface is gorgeous, the voice-over narration is haunting, and the ghostly images of Victorian female coalminers tug at your emotions (these views are not empirically researched, by the way – just old fashioned opinion!). If you don’t know much about this history of female miners, please read Underbelly and also listen to The Testimony of Patience Kershaw by The Unthanks. I was also introduced to the prolific and ever-entertaining Alan Bigelow. His Webyarns site is an example of one of the many and varied ways in which digital media can be used to tell new kinds of stories. Academic debate continues to rage over the extent to which technology drives change in the arts (and any other aspect of human endeavour, for that matter); but in the case of new media writing, it is clear to me that technology and creativity have run along hand-in-hand since we began in 2010. At our first event, Sue Luminati managed to get Chris Stevens to be our guest speaker – Chris had recently released Alice for the iPad. We gave iPads as prizes in that first year, and Alice was really very new – Dave and his team had used the original text and Tenniel illustrations, and then used every trick available to make Alice come alive via animations. The iPad allowed the user to shake or turn the tablet and make words and objects fly around. This was truly new for the reader, especially because the iPad was so portable and book-size. Eight years on, those enhancements feel like gimmicks – they don’t really add anything to the storytelling, and they are not integral in any way to the narrative. They are simply add-ons. But what add-ons! Dave sparked a near-revolution in interactive storytelling right there: this was the first piece we’d seen at the NMWP which used the possibilities of the tablet to enhance stories made for print, but since then we’ve seen other iPad adaptations, eg Inkle’s Frankenstein. We are seeing more and more apps arrive in the NMWP inbox, and I’m seeing more apps appearing on the App Store, where the affordances of the tablet and the smartphone have really changed the narrative form and the reading experience. Samantha Gorman and Danny Canizzaro won the 2014 main prize with their app, PRY. An inspiring piece which asks the reader to literally open pages of text with their fingers via iPad pinches and spreads, it combines words with video and hallucinatory animation, telling the story of a returning Gulf War veteran. Brilliant work. When PRY won, if:book’s Chris Meade wondered if this piece might well be a breakthrough for pushing interactive storytelling into the mainstream. I’m not sure that breakthrough has happened yet, (although PRY was a best seller on the App Store in 2015) but the smartphone, tablet and the app continue to offer authors tools for new and engaging reader-interactions, as well as beautiful multi-media elements. I think the ‘story-app’ might well be the way a ‘general’ readership can be attracted to spend money on digital stories. An example from the 2017 shortlist is Hilda Bewildered, by Slap Happy Larry – a modern fairy tale, with great writing, great graphics, and intuitive interactions that advance the story (and only £2.99. Buy it now!). 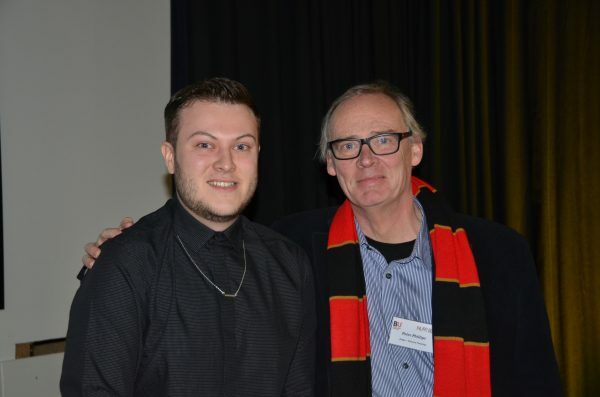 Student Award winner Shaun Hickman with Unicorn Training CEO Peter Phillips at the 2015 awards evening. Natasha Nunn’s Mary Rose, a touching ghost story. Finally, as I reflect, one of the great joys of running the event has been that I’ve had the chance to speak to and meet some very talented creative people. The NMWP wouldn’t have ever happened without the support of Chris Meade of if:book UK who sponsors main prize each year and whose Dot Award encourages new projects into being. Becoming friends with the digital artist Andy Campbell has been a real privilege. It was great to meet Kate Pullinger, Chris Joseph, and Andy when they spoke about the epic Inanimate Alice at the 2015 awards evening. And most recently, hearing Adrian Smith (who invented Lara Croft and Tomb Raider) speak at the 2017 awards was a thrill. Perhaps most importantly for me, the NMWP has given me a huge appetite for more digital stories, poems, games, and has also enabled me to offer my students much more current, relevant and innovative work to see and be inspired by. My work at Bournemouth University mainly focuses on helping students to cross the bridge of techno-fear and make their own digital stories: the NMWP has certainly provided us with stimulation for our workshops. 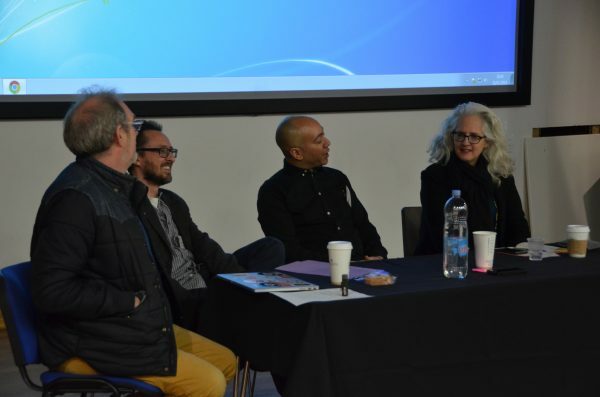 Chris Meade (if:book UK), Andy Campbell, Chris Joseph, and Kate Pullinger at the 2015 awards evening. The future for digital/interactive/hyper-writing has been debated since the late 1980’s when Michael Joyce released afternoon, a story. The early form was called ‘hypertext’ because it just that, hyper-active text. But of course we have seen huge leaps towards a multi-media form of storytelling in which all the elements on screen can be hyper-active. We’ve seen text blend more and more with visuals and sound. We have had several ‘locative’ stories entered in the past, stories which you access by physically visiting real-world paces. James Atlee’s sophisticated ambient literature creation, The Cartographer’s Confession, won the 2017 if:book New Media Writing Prize. We’ve seen the rise of the app. 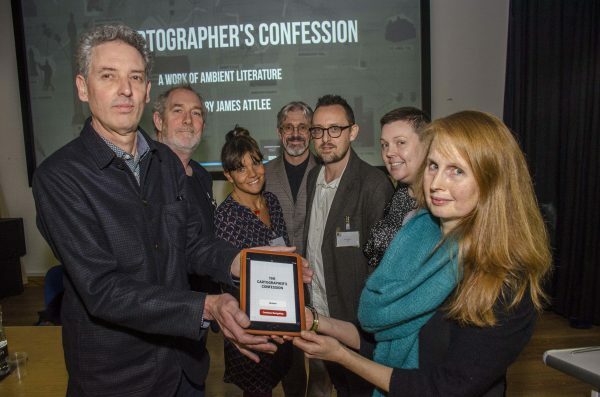 James Atlee Left) and Emma Whittaker (right) accepting their if: book UK NMWP award for the Cartographer’s Confession. So, for the NMWP, as we near our tenth anniversary, we’ll always be looking for writing that engages us, makes us want to keep reading and interacting. We’ll continue to be inclusive: we introduced the Gorkana/Cision awards for digital journalism in 2016, and this year’s winner was a powerful piece of digital/interactive journalism – Lunik IX by Magdelena Chodownik tells the story of the Romani community in a tower-block estate in Slovakia. We’ll continue to look for opportunities to celebrate the different genres of writing that use digital media in interesting ways. I want to do more for young writers in the community, for students, for writers who have no technical skills but who are fascinated by what digital media can offer them creatively. And no doubt new technologies will also continue to impact on the entries we see. It’s all exciting! Jim Pope talking at the 2017 awards evening. Dr James Pope has a continuing interest in fiction across the media, particularly looking at how digital media may be changing narrative forms and reading and writing practices. 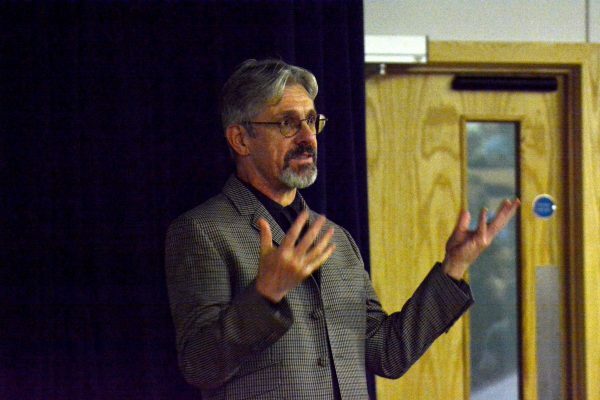 He has specific research interests in interactive fiction, the teaching of creative writing in digital media environments, and children’s literature. As well as several publications around digital interactive fiction, and children’s literature, James has also published 6 novels for children and teenagers, including Spin The Bottle (Penguin) which was listed as one of the best teenage novels of 1998 by the Federation of Children's Book Groups. He created the dedicated software platform for interactive storytelling, Genarrator, www.genarrator.org. He is also co-founder and organiser of the annual New-Media Writing Prize, now in its ninth year, which celebrates and promotes digital writing around the world. Currently he is working on a community-based digital storytelling project in a local school, and a VR narrative project with digital artists Andy Campbell and Judi Alston.